An interesting thing that I have observed about Him is that, though He is aware of need, He doesn’t necessarily respond to need. He responds to faith because faith is relational. If He responded to need, then all of the hospitals would instantly be emptied because people need to be healed. All of the children in third world countries would instantly be fed because they need to be. But they aren’t, that is, unless you and I accept His mandate to partner with Him and help those people. As we rise to answer His call and we pray, asking for His empowerment, He responds and does miracles in our midst. Why doesn’t He just come down and rid the world of the junk? He already did. Jesus Christ died a gruesome death to pay the penalty for the sin of the world – sin, by the way, that we caused through our disobedience because He gave us the gift of choice, but He cleaned it up. Now, through repentance and forgiveness, we can rise and begin to make a positive difference in partnership with Him. 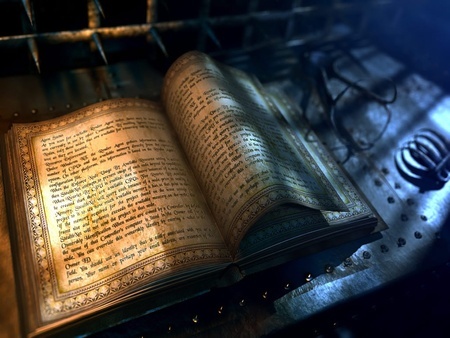 If you were given an ancient book with great wisdom bound between the covers, three things would need to happen for you to truly enjoy its treasure. 1. Apprehension – The gift will still be sitting there this time next year unless you go pick it up. The paper is pretty. The package is nice, but the book does you no good unless you hold out your hands to proactively receive the gift given. You must apprehend it. 2. Appropriation – Once received, you must open the book and begin to read. Though received, it cannot truly impact your life until you appropriate its words, promises and treasure into your today through absorption. 3. Appreciation – A book truly treasured will never be read once and then forgotten. It will become interwoven into the very tapestry of your everyday life. It becomes part of the essence of who you are. It affects your speech, your actions and your philosophies – ultimately your destiny. Such is the gift of Christ and His glory in our lives. He must be purposefully received and His love apprehended by our hearts through faith. We must proactively decide every morning to embrace or appropriate the day He has made for us and decide to let Him take the wheel so as to direct our path for success. And lastly, a treasuring of His love and lordship of our lives will cause us to make Him our lifestyle, not just a “fix” here and there. Appreciation. He wants you to experience Him. He’s here all around us but not every where manifest because faith draws Him to the scene. If you will but speak His name today, Jesus, He will begin the adventure with you. Well said, Pastor Kevin. May God continue to bless you and all of the Fellowship family!